Costuleta, Dennis Brown, Mighty Diamonds, Mad Cobra, Admiral Tibett and more. 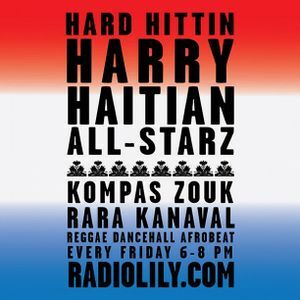 HAITIAN ALL-STARZ on RADIOLILY.COMThe show airs every Friday LIVE 6:00pm- 8:00pm from Miss Lily&apos;s Variety 130-132 West Houston (at the corner of Sullivan) in the West Village. The show is hosted by Hard Hittin Harry, DJ JayCee, DJ One, and Nit Ra Sit and features Kompas, Ra Ra Kanaval, Zouk, Reggae, Dancehall, Afrobeat and much more. We discuss all things Haitian infused with American and World Pop culture, politics, entertainment, and current events. We look forward to your thoughts, insight, and knowledge of our beloved country of Haiti and anything else you would like to discuss. Please post via your Facebook, Twitter, or any other social media...In other words....spread the word! Love sharing you posts on here. Keep up the great work so I can share it more.